On Kerfuffle With Chinese Officials, Obama Says: Don't 'Over-Crank' It : The Two-Way "The seams are showing a little more than usual," President Obama says, describing the tense chaos that marked his arrival in China. From a lack of stairs to heated arguments, friction was obvious. Brazilian President Michel Temer (left) used red-carpeted stairs when he landed at Hangzhou Xiaoshan International Airport one day before President Barack Obama — who's seen disembarking from Air Force One in Hangzhou Saturday, using his plane's airstairs. "The seams are showing a little more than usual," President Obama says, quoting his press secretary to describe the tense chaos that marked Obama's arrival in China for his final G-20 economic summit and his last visit to Asia as president. 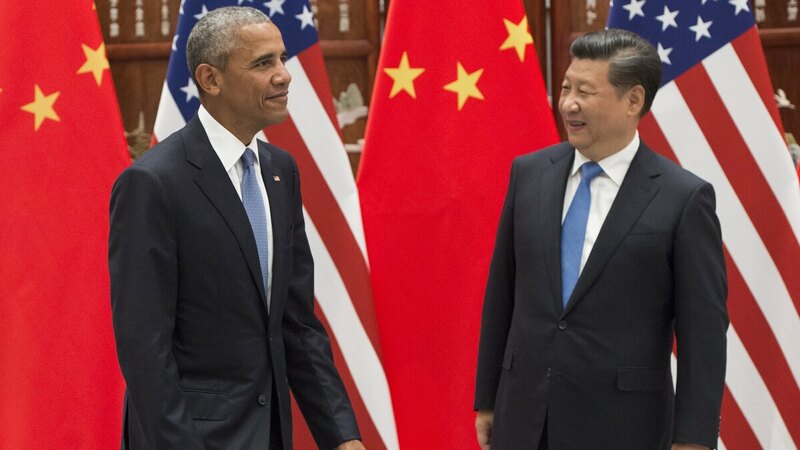 Interactions between Obama and China's President Xi Jinping reflected little if any of those tensions — and the pair signed papers that formally joined the climate deal that was reached in Paris. But the American president's arrival at Hangzhou this weekend was extraordinary, from the lack of a mobile staircase at the tarmac to at least two shouting matches that occurred between Chinese and American officials. The absence of a staircase was striking, and it was seen as a snub by media outlets from The Economist and The Globe and Mail to Voice of America. Even the normally low-key U.S. Defense Intelligence Agency weighed in, with a (since-deleted) tweet that said, "Classy as always China." The agency later tweeted an apology for the remark. Consider that one day before Obama's arrival, Brazil's President Michel Temer, who only recently shed the word "interim" from his title, got the red-carpet treatment when he landed at the same airport in Hangzhou, China, using a carpeted mobile staircase to disembark from this plane. And just months ago, Obama was provided with a red-carpeted staircase when he arrived for a state visit last fall. For this visit, Obama was welcomed with a red carpet on the tarmac — but no mobile staircase, presenting a puzzling scene. An anonymous Chinese foreign ministry official has since told the South China Morning Post that the decision to use Air Force One's rear door was made by the U.S. delegation after a discussion about the mobile staircase, but U.S. officials haven't confirmed that version of events. Obama downplayed the incidents Sunday, saying that frictions sometimes emerge when a U.S. president visits another country — as well as when foreign leaders visit Washington. There were also altercations. As Brakkton wrote for the Two-Way, some of them centered on journalists — their presence on the tarmac and the number that would be allowed to trail Obama's movements. In addition, a Chinese official tried to block National Security Adviser Susan Rice and Deputy National Security Adviser Ben Rhodes when they tried to move from the press area on the tarmac over to President Obama. In a scene at the airport that was captured on video, a White House press aide told a Chinese official who wanted the media to leave that U.S. journalists would stay on the tarmac to see the U.S. president — and that they were standing under the wing of a U.S. plane. In response, she was told, "This is our country, this is our airport." "It is true that not for the first time, when we come here, there ends up being issues around security and press access. And part of the reason is because we insist on a certain approach to our press pool, for example, that other countries may not insist on. "We think it's important that the press have access to the work that we're doing, that they have the ability to answer questions. And we don't leave our values and ideals behind when we take these trips." "It can cause some friction. It's not the first time it's happened. It doesn't just happen in China — it happens in other countries where we travel. I think this time maybe, as Josh put it, 'The seams are showing a little more than usual,' in terms of some of the negotiations and jostling that takes place behind the scenes." Some of the behind-the-scenes images we've seen from the airport include the sight of U.S. security personnel standing on the tarmac with binoculars, surveying the surrounding area. Others were crouched on the ground to inspect a manhole cover. Another confrontation blossomed at a security checkpoint where White House advance teams including staff, protocol officers and Secret Service agents, "engaged in 'heated arguments' with Chinese officials for about 15 minutes," as Brakkton reported. In that scene, two Chinese officials — one helping the Americans and the other working security — had to be physically separated. "That's part of our job," President Barack Obama said of any tensions in his visit to China. Here, Obama and President Xi Jinping attend a meeting at the West Lake State House in Hangzhou, where world leaders are gathering for the G-20 Leaders Summit. The incidents reflect only a fraction of the American projection of security and force when the president travels. Acknowledging that point, President Obama said, "We've got a lot of planes, a lot of helicopters, a lot of cars, a lot of guys. You know, if you're a host country, sometimes it may feel a little bit much." That impression isn't limited to China, Obama said. He said friction has also developed when the U.S. leader visits close allies. Speaking alongside British Prime Minister Theresa May, Obama continued, "You notice some chortling among the Brits. They probably find it a little overwhelming as well." With China, Obama said, tensions can arise over issues such as human rights — but, he added, "that's part of our job, that's part of what we do. And so I wouldn't over-crank the significance of it." "But the one thing I will say is we don't make apologies for pushing a little bit harder when it comes to press access. And that's been the case from my very first state visit here. And we don't always get everything that we'd like to see, but we think it's important for us to at least stand up for those values." When he leaves China, Obama will head to Laos, which is hosting next week's Association of Southeast Asian Nations (ASEAN) summit. As NPR's Elise Hu reports, it'll be the first time a sitting U.S. president has ever visited the small nation.